FabFilter Twin is a synthesizer plug-in that focuses on three areas: uncompromised sound quality, creative and virtually unlimited modulation, and an adaptive, easy-to-use interface. The oscillators and filters, the most important building blocks of every subtractive synthesizer, are smooth and powerful and give Twin 2 its distinctive analog character, according to FabFilter. Complementing this is a comprehensive modulation system that lets you easily modulate almost any setting by a practically unlimited number of modulation sources, from XY controllers and programmable step sequencers to any type of MIDI data. The Mac version comes in VST, RTAS, and AU formats. 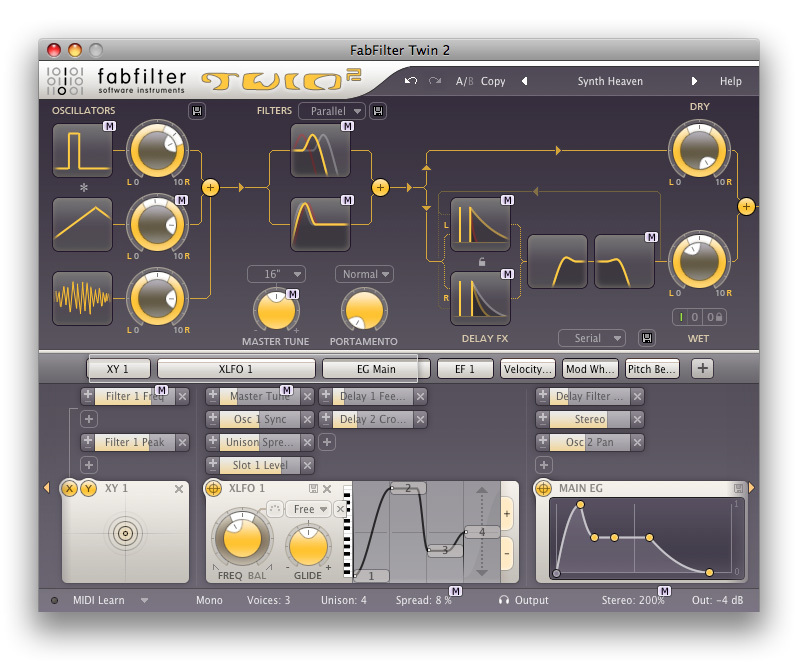 To harness all this power, FabFilter Twin 2's user interface only shows the components that are actually in use. A clean and uncluttered routing diagram gives immediate control over the main synthesizer settings, while full access to all parameters is only a mouse click away. At any time, you can add new modulation sources or remove unused ones. Almost any parameter is a modulation target: simply use drag-and-drop to create modulation connections, which are conveniently grouped with the modulation source. The interface always shows which parameters are modulated and you can instantly view all related modulation sources and slots. With Twin 2's modulation system, it is easier than ever to add modulation or to find out how a factory preset works. Three oscillators with sawtooth, square, triangle, sine, and pink/white noise wave forms, ring modulation, hard sync, pulse width, phase sync, stereo panning and polyphonic portamento. Two independent multimode filters with 11 different filter characteristics. On-board delay effects section with two delay units and two extra multimode filters in the feedback loop. Clean and uncluttered interface that only displays the components that are actually in use. - Up to 4 XY controllers. - Up to 6 XLFOs offering everything from classic LFO shapes to 16-step programmable step sequencers, per-step glide with adjustable glide curve, "snap" option that locks steps to musical notes to create arpeggio-like sequences, modulatable phase offset, and much more. - Up to 6 envelope generators with graphic controllers and optional side chain input. - Up to 4 envelope followers, triggering on side chain input. - Up to 10 MIDI sources that let you use any type of MIDI data as a modulation source. More than 1600 professionally designed and categorized factory presets. The usual FabFilter goodies: fine-tuned knobs and controllers, section presets, interactive MIDI Learn, undo/redo and A/B switch, Smart Parameter Interpolation for smooth parameter transitions, an extensive help file with interactive help hints, sample accurate automation, AltiVec and SSE optimization and more. Corrected issue with typed parameter values rounded incorrectly. External side chain input bug now working properly in Pro Tools. FabFilter Twin 2 can now remember which section in the component display is expanded in Wide mode. Bugfix for compatibility issues with Adobe Premiere. Bugfix for bug where the mono AudioSuite plug-ins cause the Whole File option at the bottom to be disabled.